Types of Pool Cleaners: Which One Should You Buy? Ahhh—the joys of pool ownership. Swimming, entertaining, and keeping cool during those hot months of summer. If you don't hire a pool cleaning service or pro to clean and maintain your pool or spa, you need to have a pool vacuum cleaner, unless you want a green swamp, a breeding ground for mosquitoes, and someone from the city ringing your doorbell informing you neighbors have been complaining about your dirty pool. So you get that some type of pool cleaning system will be one of your next major purchases. But how do you determine which one is the right one for your particular pool or hot tub? Sit back and relax on that lounge chair as we demystify the world of pool cleaners for you. At the very basic level are manual cleaners, like handheld vacuums, brushes, and skimmers, and scrub brushes, which attach to a telescoping pole for accessing the deepest reaches of the pool. This method allows you to scrape the sides and bottom of a deep pool and sweep off all that green and yellowish algae. It's a great upper-body workout, and also fairly time consuming, but doable and inexpensive. Good for: Old-fashioned purists, those who find it therapeutic, or toned gods and goddesses. 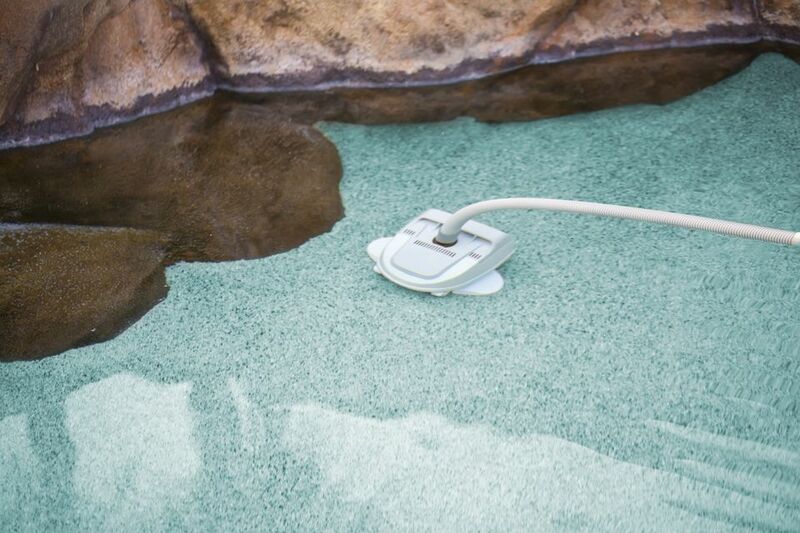 With manual vacuums, the operator maneuvers it across the pool's surface, similar to vacuuming the floor of your home. A handheld vacuum has no mechanical parts and is an inexpensive way to improve your pool's filtration system. A warning: the bigger the pool, the longer it will take to clean the pool—possibly a few hours. Count on backwashing the filter after vacuuming to add more time to the chore. Good for: The aforementioned reasons, including those who want or need to save money. These are also referred to as suction-side cleaners connect to the filtration system's water intake and utilize the pool pump suction power to collect debris. Suction-side pool cleaners require that the pool pump should be running during operation, which means they'll be using more electricity than other types of pool cleaners. Because they require more-frequent filter cleaning, more DE will need to be used. Good for: Pools with existing pumps and filters that are in good condition and are the right size for the task. However, be prepared to clean and backwash your filters frequently since more than the normal amount of dirt is being added to the unit. One of the most popular types of automatic pool vacuums, robotics power independently of the swimming pool circulation system. Of all the different types of pool cleaners and vacuums, robotics are considered the most energy efficient. Self-contained units with a built-in filter and motor, robotic cleaners are able to grab the smallest particles from all types of pool surfaces. Some models come equipped with fun features like remote controls for spot cleaning and, four-wheel drives. Good for: An above-ground pool that isn't equipped with a skimmer basket, because it will clean the pool automatically. Also known as pressure-side cleaners, cleaners use the pump's power to accelerate their movement along the surfaces of the pool.operate under their own power, independent of the swimming pool circulation system. Mounted on wheels to easily move around, pressure cleaners don't scrub the pool surfaces in the same manner that contact-type cleaners are able to. No stress is added to the pool filter because pressure pool cleaners come equipped with their own filter bags. If you add a booster pump, this type of cleaner can become more powerful. Good for: Pools that have lots or larger pieces or amounts of debris and dirt. Many of the more luxurious in-ground swimming pools have in-floor automatic vacuum systems, which are installed during the construction process. Jets are built into the bottom of the pool and connect to its return line. When the whole system is turned on, heads pop up and a booster pump generates and forces a high pressure swirl of water. A strong current is produced as the water moves along the pool's floor, and dirt and debris and forced toward the main drains. The main pump siphons the debris out of the pool and it is transported to the filtering system. Good for: In-ground swimming pools that are in the planning stages of construction and for those whose budgets can afford it. Interestingly, some of these pool owners won't even be aware that their pool has an in-floor cleaning system, nor will they care—just so long as its clean.